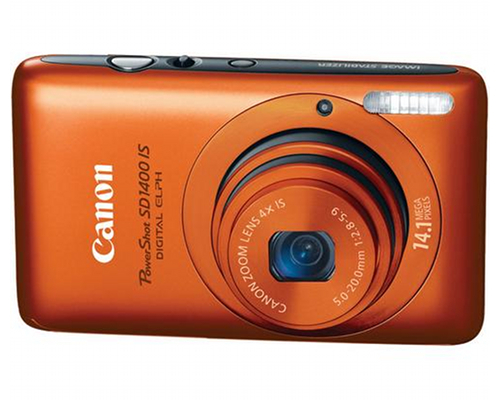 The Canon PowerShot SD1400 is a consumer point and shoot digicam with fairly standard and relatively dated performance and feature offerings in a concise, tiny package. The camera measures 3.63" by 2.21" by .7" and weighs approximately 4.69 ounces, making it particularly small, even for point and shoot digicams. The camera captures photos with a 14.1 megapixel resolution captured by a 1/2.3-inch type Charge Coupled Device. It has a total of 14.5 megapixels and 14.1 megapixels effective. It has a 4x digital zoom and a focal length of 5 (W) to 20 (T) mm, equivalent to a 35mm film camera's 28 to 112 mm. The camera's focusing range in normal mode is between 1.2" and infinity (W) and 2.6' and infinity (T), and in Macro is between 1.2" and 1.6' (W). It also includes a TTL Autofocus. The camera includes a 2.7" TFT color LCD. It has approximately 230000 pixels and 100% coverage. It does not, however, include an optical viewfinder, consistent with most compact point and shoot digicams. The camera has a maximum aperture of between f/2.8 (W) and f/5.9 (T) and a shutter speed 1/1500 to 1 second. Its shutter speed range is between 1/1500 and 15 seconds, and the long shutter operates with noise reduction when set between 1.3 and 15 seconds. Long Shutter speeds available are 1, 1.3, 1.6, 2, 2.5, 3.2, 4, 5, 6, 8, 10, 13, and 15 seconds. The camera offers automatic sensitivity settings, as well as equivalent settings to ISO 80, 100, 200, 400, 800, and 1600. It performs light metering via evaluative controls, center-weighted averages, or spot analysis, and offers exposure control through Program AE, i-Contrast, and AE lock settings. Exposure compensation can move between -2 and +2 stops in 1/3-stop inrements. White Balance Control settings include automatic adjustments, Daylight, Cloudy, Tungsten, Fluorescent, Fluorescent H, and custom settings. Shooting modes can be automatically configured or set to P, Portrait, Night Snapshop, Kids & Pets, Indoor, Smart Shutter, Low Light, Color Accent, Color Swap, Fisheye Effect, Miniature Effect, Beach, Underwater, Foliage, Snow, Fireworks, Long Shutter, Stitch Assist, and Movie. Photo Effets include My Colors Off, Vivid, Vivid Blue, Vivid Green, Vivid Red, Neutral, Sepia, Black & White, Positive Film, Lighter Skin Tone, Darker Skin Tone, and Custom, where users can adjust contrast, sharpness, saturation, red, green, blue and skin tones. The camera's self-timer can function on a 0-10 second delay, configurable in 1-second increments, and offers between 1-10 shots at a time. Continuous shooting is available at approximately .7 frames per second (and approximately 2.6 shots per second in low light). Wireless control is not available with this camera. The camera stores photographs and videos on SD, SDHC, and SDXC memory cards, as well as on MultiMediaCards, MMC Plus Cards, and HC MMC Plus Cards. The camera compresses JPEG images using Exif 2.2 and captures movies in the MOV format, using H.264 for images and Linear PCM to capture audio. The camera captures still images between the sizes of 640 by 480 and 4320 by 3240, depending on the settings used. It captures movies in sizes between 320 by 240 and 1280 by 720, again depending on settings used. Unlike other Canon point and shoots from the last several years, this model can capture HD video, though saving it to memory cards is space-intensive. The camera can capture up to 60 minutes, or 4GB per clip, of standard-definition video, but only 10 minutes of HD video before reaching capacity on a 4GB card. The camera connects to systems via a USB interface and outputs video in both NTSC and PAL. Audio output is in mono. It also includes a mini-HDMI cable to share HD video and support for PictBridge-compatible printers to enable direct printing. The camera is powered by a rechargeable lithium-ion battery, which can be charged using an optional AC adapter kit. The battery is rated to capture 230 shots or offer 6 hours of playback with the LCD on. The camera does not offer a particularly sophisticated aperture or shutter control. Available accessories for the camera include a metal neckstrap, a case, a waterproof case, battery packs, AC adapters and battery chargers, interface cables, AV cables, and mini-HDMI cables, as well as a high-powered flash.